In July, the U.S. economy created 215,000 new jobs, according to an August 7 report by the Bureau of Labor Statistics (BLS). Total nonfarm payroll employment increased by 215,000—though that figure is down slightly from Wall Street’s expectations of 225,000 new jobs. The unemployment rate was unchanged at 5.3 percent, in line with Wall Street’s projections. According to BLS, last month’s job gains occurred in retail trade, health care, professional and technical services, and financial activities. The government also revised jobs data for May and June to portray a more optimistic economic landscape–with 14,000 more jobs created than previously reported. While the labor participation rate remains at historic lows (62.6 percent in July), the U.S. economy has added jobs over the past three months. 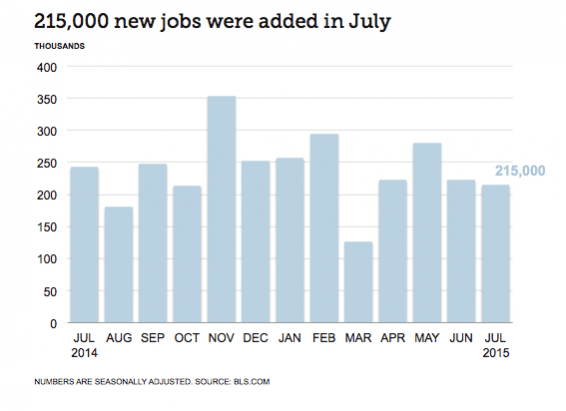 “Over the past 3 months, job gains have averaged 235,000 per month,” according to BLS. But wage stagnation remains a key concern for many economists and households.